The What: Following up on its Studio 26 and Studio 68 high-definition recording solutions, PreSonus announced the Studio 1810 and Studio 1824 USB 2.0 audio/MIDI interfaces. The What Else: Both interfaces’ outputs offer flexible routing with zero-latency DSP-based monitor mixing and control-room integration with included PreSonus Studio One Artist for Mac and Windows and free PreSonus UC Surface for Mac, Windows, iPad, and Android. They also come with the Studio Magic Plug-in Suite for Mac and Windows, which provides seven popular plugins in VST, AU, and AAX formats. The Studio 1810 USB 2.0 audio/MIDI interface records up to 18 simultaneous inputs. This includes two combo mic/instrument/line inputs and two combo mic/line inputs, all with XMAX Class A mic preamps and global +48V phantom power; four back-panel, 14² TRS line inputs; eight channels of ADAT Optical input (four channels at 96kHz); and stereo S/PDIF inputs. They feature eight outputs, including left and right, 14² TRS balanced main outputs with dedicated level control and Mute, four 14² TRS balanced line outputs, and stereo S/PDIF outputs. All analog line outputs are DC coupled for sending control voltages. Two loud, clear headphone outputs include A/B switching for monitoring different mix streams. The Studio 1824 audio/MIDI interface records up to 18 simultaneous inputs (8x8 at 192kHz), including two mic/instrument/line inputs and six mic/line inputs, all with XMAX Class A mic preamps and global +48V phantom power, plus eight channels of ADAT Optical input (four channels at 96kHz) and stereo S/PDIF. The Studio 1824’s 18 outputs include eight 14² TRS balanced line outputs; stereo main outputs (which duplicate line outs 1/2), with dedicated mute and mono buttons; eight channels of ADAT optical output (four channels at 96kHz); and stereo S/PDIF. As with the Studio 1810, all Studio 1824 line outputs are DC coupled for sending control voltages, and feature two stereo headphone outputs with independent mix streams. The Studio 1824 also provides BNC word clock output. 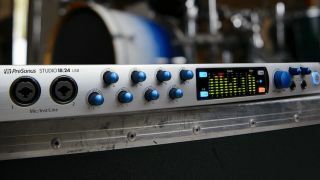 The Bottom Line: The new interfaces record at up to 24-bit, 192kHz resolution and feature PreSonus’ XMAX Class A microphone preamps, audiophile-grade digital converters, ultra low-jitter clocking, and MIDI I/O. All analog inputs and the main L/R outputs have eight LED, ladder-style level meters.